Meatless burgers come in all shapes and sizes. 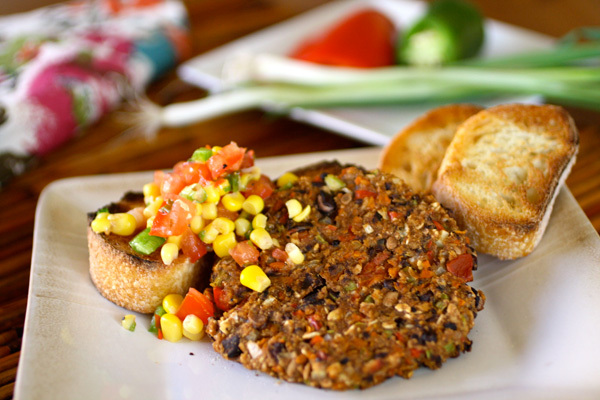 This black bean veggie burgers recipe with corn salsa is great because you can customize it — and you can freeze a portion to save for a hectic day! A bunch of fresh veggies, some beans of your choice and tasty seasonings are the main ingredients in this meatless burger recipe that will have you foregoing your favorite frozen brand from the grocery store. No joke! These burgers from Grab a Plate are easy to make (and they’re baked! ), turn out moist with great texture and freeze well for another day. Your options are only limited to your choices! Add the corn salsa to top the burgers and you’ve got yourself the makings of a great Meatless Monday dish! If it’s possible, start your salsa first before your burgers to give it time to let the flavors mix together. Eliminating meat from your diet even one day a week can help keep your weight down, fight diseases, reduce pollution and even help you avoid the risk of food-borne illnesses. Whether you’re just getting started with going meatless or you’re an old pro, these burgers are an easy (and enjoyable) way to make the swap. Mix all the salsa ingredients together and chill for about an hour before serving. Preheat your oven to 425 degrees F. Spray two baking sheets lightly with the nonstick spray and set aside. Add the carrot to a bowl with a little water, cover it and microwave for about two minutes. Once cooled, mash them and add them to the mashed black beans. Mix together, and then add the remaining vegetables and mix well. Add the oatmeal, breadcrumbs, seasoning and salsa. Mix together until combined. Add the flour and mix well. If the mixture is too moist, add more flour and adjust the seasoning, as needed. Form the mixture into patties and place them on the baking sheets. Bake for about 20 minutes, flipping them halfway through cooking. When the burgers are finished, serve with the corn salsa or your favorite topping. It’s easy to go meatless for a meal when you have great tasting options and a burger recipe like this one! These burgers make going meatless very easy!